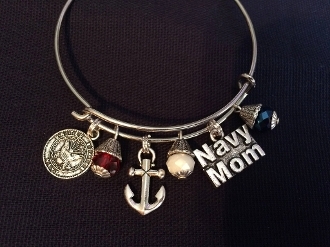 Silver toned Charm Bracelet with red, white, and blue jewel charms, Navy Mom charm, United States Navy charm, and anchor charm. This piece is beautiful. The pictures do not do the jewelry items justice. This item has FREE Shipping! Copyright © 2010-2019 Unique Memory Makers, PIR Ribbons, Pass in Review Ribbons. All rights reserved.